Bonny Doon Llama Packs are used by commercial llama packers, veterinarians, parade marchers, weekend hikers, competitive llama racers, and cross-country llama trekkers. The packs have crossed Death Valley, scaled Mt. Whitney, and reached the bottom of the Grand Canyon. In the 1989 Colorado Llamathon, four of the top five finishers in the Stud Division wore Bonny Doon Llama Packs. 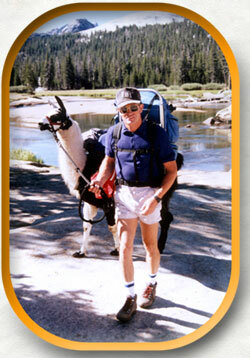 In the 1993 California California Llamathon, ten of the top twelve finishers in all divisions wore Bonny Doon Llama Packs! "I pack hundreds of miles each year with a string of six llamas. I've looked at all the packs on the market and I'm convinced that Bonny Doon Llama Packs are superior in price, quality and design. I wouldn't hit the trail with any other pack." ~ Mike Larrabee, (pictured above) Two-time Olympic gold medallist in track & field, former consultant to Adidas Shoe division, and seasoned llama trekker. "Designed by llama packing pioneer Eric Hoffman, perfected by Michael Larrabee, mountain climber extraordinaire and the 1964 Olympic Gold Medal winner in the 400 meter dash, The Larrabee Pack is your best choice for llama packing into North America's most rugged wilderness areas. I've used Eric's Bonny Doon llama pack for fifteen years on numerous trips into Colorado's Weminuche Wilderness, Arizona's Superstitition Wilderness, and Wyoming's Wind Rivers. In 1999, my llama pack string crossed Jackass Pass into the Wyoming's Cirque of the Towers, a feat no horse packers has ever accomplished. My Bonny Doon saddle and panniers have withstood hundreds of miles of trail usage, and are ready for many more years of service. The aluminum frame of the Larrabee Pack adds strength and stability to the system, so the load will remain in place, without shifting, for miles and miles. The Larrabee pack's form fitting saddle avoids all contact with the llama's spine. 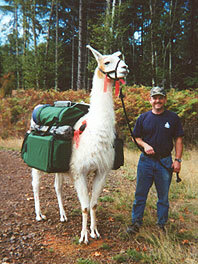 I recommend, without reservation, the Larrabee Pack for the serious llama packer." "I would like to take this time to thank Bonny Doon Packs for an excellent style of pack. I currently use my llamas for archery hunting deer and elk in the rugged areas of Washington State and go where there are very few trails or roads. The Bonny Doon works well in those adverse conditions. I have tried many different types of llama packs in the past, but I still keep going back to the Bonny Doon. Whether it is a day scouting trip with our nephews and nieces or a full hunting trip, Bonny Doon still does the job for me. I'm looking forward to using the new Expedition [note: the Expedition is now called "The Larrabee"] pack, as I believe it will work well with my pack string of llamas. The relaxation of the great outdoors, and knowing that we have all the comforts of home from camping gear, to the coolers inside the Bonny Doon Pack that keep our food and drinks cold [note: The Larrabee Pack is not sold with coolers, but widely available coolers fit snugly inside the Larrabee Pack's panniers], our family believes that this Expedition pack will offer more excitement to our camping and hunting trips in the future." We're confident that Bonny Doon Llama Packs offer the best pack at the best price - Guaranteed!